With her upturned bow and long overhangs, Fazisi was easy to spot as she sailed around the world. The reality of our adventure turned out entirely different from the way the team had dreamt it would. We were naive and ignorant when we started, we simply had no idea of the magnitude of the challenge before us. Too often beset by bad luck and endless trials, it felt as if we had reached a dead end. Hope had become just a small voice in a gale, but it led us forward through perilous times. And there always was a light at the end of the tunnel. We persevered; we never ceased fighting and in the end came out winners. Not of the race itself, in which we finished 11th, but of the struggle against time, obstacles and our own shortcomings in circumstances that made it nothing short of a miracle. In retrospect, our survival was a victory against all odds. 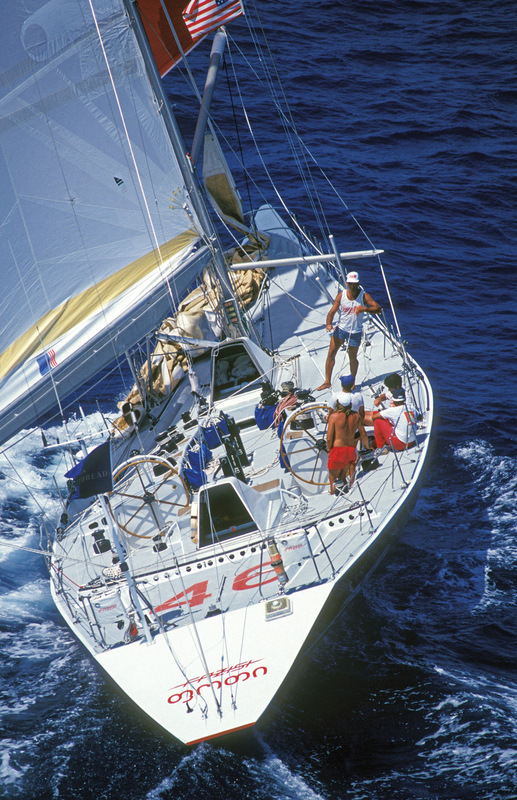 Fazisi was a novel design in the 1989-1990 Whitbread Round the World Race. judges, and a Russian art action in Palm Beach. There was even a Fazisi boxing match with Mohammed Ali as the referee! Yes, those were amazing times. Of course, I’m very happy that we were able to pull all this together, and as designer I am mostly satisfied with the way the boat had sailed, but at the same time it makes me sad to realize that we never saw her full potential. With her slender profile and low freeboard, Fazisi was a wet boat, but all fast boats are wet. We’ve got foul weather gear to deal with that. Besides, you have to be ready to get wet if you want to sail fast, especially on the ocean. And Fazisi’s crew was willing to sacrifice some comfort for speed. Spray shooting in your face is an indicator of speed, and that’s a good sign. A sailor that doesn’t like water is like a banker that doesn’t like money. Fazisi’s cockpit is relatively compact, placing the helmsman, mainsail and headsails trimmers right next to each other for excellent communication. Some of the elements of this layout were later adopted by ocean racers and even America’s Cup boats. Fazisi was built to a large extent by her amateur crew, who had varying degrees of boatbuilding experience. As the construction was falling behind schedule, under constant pressure, the weight management became sketchy and as a result, Fazisi came out much heavier than designed. That forced us to replace the keel at the last moment just to get the boat to meet the rating requirement and enter the race, making her even heavier. Had she been built to correct weight specifications, there’s no doubt in my mind she would have been much faster on all points of sail. Who knows, we could have finished at the podium. To me it was—and still is—a missed opportunity. Fazisi’s post-Whitbread life was significantly less dramatic as she was gradually turning from a racing thoroughbred into a sailing workhorse, a fate typical for retired racing yachts. After the Whitbread finish, Fazisi sailed back to United States to participate in a goodwill tour along the entire East Coast from Maine to Florida with a joint crew of Russian and American sailors. It was a fantastic time, just after the fall of the Berlin wall and at the height of Perestroika, when for a short time it seemed that the Cold War was a thing of the past, that America and Russia could be partners, not enemies. Eventually Fazisi was sold and then she changed hands several times until she was purchased by the Association of Polish Yacht Clubs of North America. The boat continued sailing and racing actively, crossed the Atlantic several times, participated in Chicago-Mackinac races. She spent her time between Polish yacht clubs in Chicago, Toronto and New York, wintering in the Caribbean and South Florida. And that’s where she met Hurricane Irma and her fate. Seeing Fazisi on top of the salvage barge was a shock, but I realized that everything comes to an end eventually. Former crewmember Yury Raul bought the boat before she became scrap and is now looking at a way to put the pieces back together again. She had a great, eventful life, made many people happy and she will be fondly remembered all over the world. That night I toasted Fazisi’s great life with a shot of good brandy and went to bed. 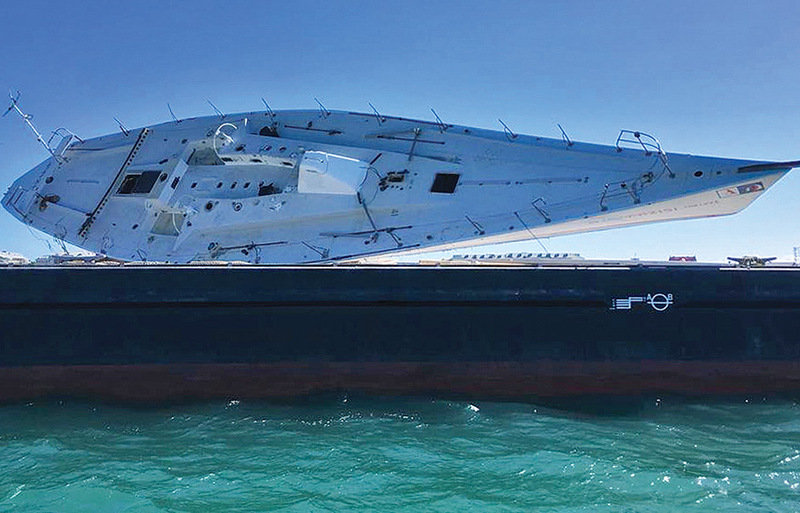 A few hasty phone calls later I learned that at the very last minute recent Fazisi crewmember Yury Raul, a Russian living in Chicago, who flew to Florida to wave goodbye to Fazisi, jumped in and bought the boat just in time before she was scrapped. Now she is safely moored off Key West. It was a purely emotional purchase. Yury is not a rich man and doesn’t have the means to restore the boat. He contacted me and we started brainstorming on what could be done to save the legend. Of course, for me Fazisi is much more than just a boat. She is the big part of my life. And while I’m fully aware of the enormity of the task of saving Fazisi considering the state she is now, I want to give it a try. It’s not hopeless, actually. I could see two scenarios that might work. The easier one is to turn Fazisi into a monument placed somewhere in Russia, on the St. Petersburg waterfront perhaps, a beautiful sculpture celebrating Russia’s biggest achievement in ocean racing. I think that could be accomplished at a fairly modest cost. 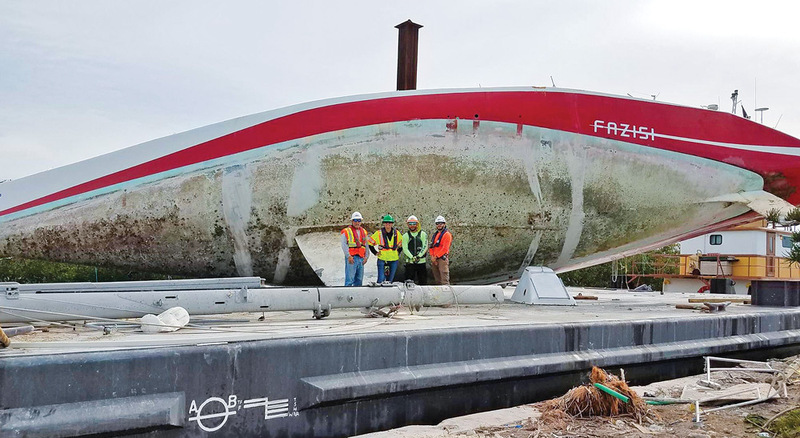 Fazisi was thrown ashore in the Florida Keys during Hurricane Irma, and laid there for months as thieves stole hardware and most other equipment of value. Another one, much more ambitious, is to restore the boat to her past glory, to do the full refit. This is a huge task, but building her in the first place was no small feat. Should we try to return Fazisi to a true joint Russian-American venture as it was intended from the beginning, sponsored by both American and Russian companies and individuals? Or convert her into a training vessel, where young sailors from all over the world would be getting their offshore experience while leaning the legacy of the great ocean racing? Will Fazisi rise again for another glorious life? Only time will tell. 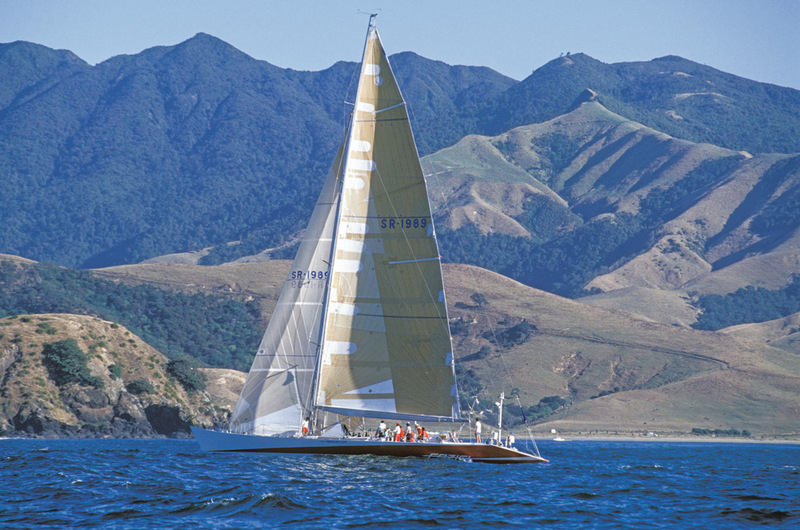 Following the Whitbread 1989-90 and the goodwill tour in America, Vlad Murnikov worked as design consultant for Ted Hood and Little Harbor Boatbuilders. Soon after he established his own business to continue pursuing innovation started with the Fazisi design. He went on to design the mx20 and the mxRay, the first ever production singlehanded dinghy equipped with asymmetric spinnaker and capable of speeds over 20 knots. Vlad invented and tested the radical “flying keel” and continued experimenting with advanced hull shapes and new aesthetics for both sailing and power yachts, combining avant-garde ideas with high respect to classic lines and proportions. More of his work can be seen at www.vladmurnikov.com.